cooperking.co.uk: Sailing over the internet. Certain things are found, certain things are lost. Sailing over the internet. Certain things are found, certain things are lost. A few months ago I watched a programme calles Scandals on BBC2. It was a brief history of scandals throughout the 50s and 60s. 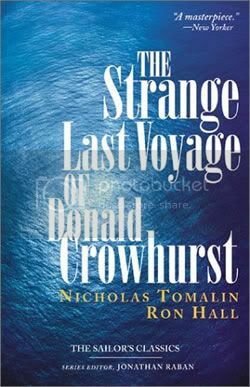 One in particular caught my interest: the story of Donald Crowhurst. "In the autumn of 1968, Donald Crowhurst set out from England in his untested trimaran, a competitor in the first singlehanded nonstop around-the-world sailboat race. Eight months later, the boat was found in a calm mid-Atlantic, structurally intact with no one on board. Through Crowhurst's logs and diaries the world learned that, although he had radioed messages from his supposed round-the-world course, he had in fact never left the Atlantic.... Drifting around in the South Atlantic, Crowhurst, a failed businessman, saw himself as Einstein's equal - a man who'd found the Truth at sea. When he stepped off his boat, carrying the ship's clock and his faked logbooks, he may actually have expected to walk on water." I thought a lot about Donald being so alone, tried to imagine what was going through his mind in those days when he was sailing around in circles. It's such a disturbing story of how a man's life can so easily break in two with the pressure to stay true to a lie. He filled in two log books, one where he really was, one where he was meant to be. I searched the net to see if I could find out anything else about him. I found out an opera had been made about him, called Ravenshead, by Steven Mackey and Rinde Eckert. Half of this play was based on Crowhurst, half on a 74-year-old woman called Sarah Krachnov, who died after making 167 consecutive transatlantic plane journeys with her grandson, becoming the world's first jet lag fatality. Wow. A woman who dies of jet lag? Now I've got two amazing stories. I tried to find out more about this woman. Time and again, sources referred me to an interview with Paul Virilio called The Third Window, but I couldn't find the interview anywhere on the net. So I got my brother to get the book out of the LSE library for me. It's in a book called Global Television, edited by Cynthia Schneider and Brian Wallis. "... In fact there are several people like this who have interested me. Sarah Krachnov, for example: she's the American grandmother who in six months crossed the Atlantic one hundred and sixty-seven times to enable her grandson to escape the pychiatrists. This little kid was seven or eight; his father wanted him to undergo analysis or psychiatric treatment, and the grandmother said no, it's out of the question. She took the kid and she did Amsterdam-New York, New York-Amsterdam... like that for six months without ever leaving the hotel room, the plane etc. And the kid's father tried to join them, but never caught up with them, and she died after six months because of the time zone, finally... Well, this woman for me is a marvellous heroine. she lived precisely in this deferred time, and a different time in which her son couldn't catch up with her." It's a really interesting interview and it's full of ideas, several of which I don't quite understand. But the lack of detail he gives about Krachnow intrigues me. Did she even really exist? Why does the source of any information about her always lead back to this one interview? If anyone knows anything more about Sarah Krachnow I would really like to hear from you. So I feel I've got so much more investigating I can do about this. But for what purpose? Because it makes me feel like an explorer and a detective at the same time. Things are out there that I didn't know about and it's amazing to suddenly find a new world, just because of one accidently watched programme. Maybe I'll email the writers of the play and opera, ask them what inspired them so much about these two stories. I'll let you know if I hear anything back.